High quality programmable DC power supply with three outputs (+6 V / 5 A, +25 V / 1 A, -25 V / 1 A, max 80 W). 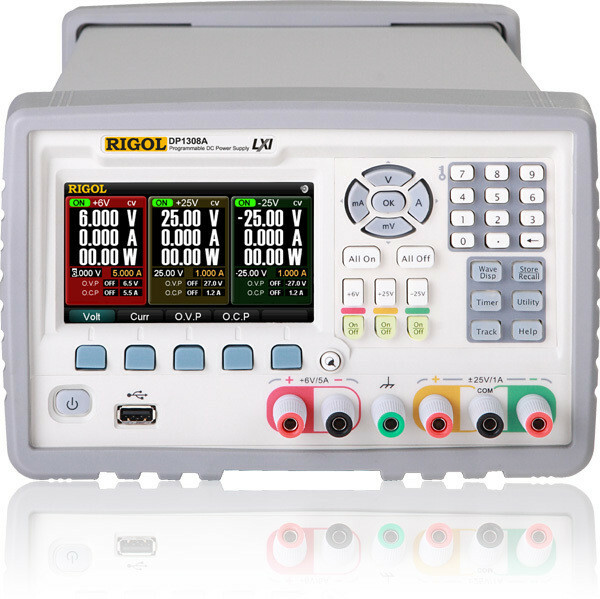 The Rigol DP1308A is a very high quality programmable laboratory power supply with three switchable outputs (6 V/5 A, +25 V/1 A and -25 V/1 A) and a maximum power output of 80 W.
For a laboratory power supply, the Rigol DP1308A features a particularly large (10.9 cm / 4.3") and easy to read TFT color display. In addition to the normal digital displays for voltage, current, and power, these values can also be displayed as signal curves. A timer control can be used to set the output signal to different values in up to 5 steps. The DP1308A offers a range of display modes in which the value of any output can be shown in a detail view while the two other outputs still remain visible. The two 25 V outputs can be coupled. When the tracking function is activated, you only need to change one output and the other 25 V output is automatically set to the same value (with the corresponding reverse polarity).